It was a mammoth effort but we did it. 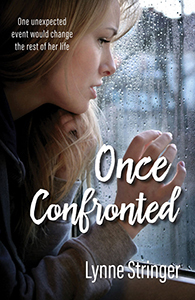 The cover of Once Confronted has been finalised. Hooray! I’d like to thank all those people who voted on the two different cover options that my publisher put up on her Facebook page. You can see the post here. For a while, both covers were neck and neck, before the second cover pulled away and won with more votes. It was great to see so many people involved in the process and it was a big help. I preferred the other cover and was unsure about the second, mainly because I know some people don’t like clear images of characters on the front covers of novels. That so many people voted for that one made me feel more comfortable about using it. Some covers can be particularly difficult and this was one of them. I trawled through hundreds and hundreds of stock photos looking for any that were suitable. It always surprises me how hard it is to find a good image, especially considering how many are available. Finding one that’s just right is tricky. The struggles we had with this cover were similar to how long we took to get the cover right for The Heir. I remember we asked people for their opinions on that one too. The Crown‘s cover was the most difficult, though. I thought it was going to be the easiest. I mean, how hard could it be to find a photo of a crown? Sure, there were plenty of them, but finding the right one? That proved impossible, which is why we ended up designing our own. The Reign‘s cover was the easiest. I found the image while we were working on the image for The Crown and that was it! You can see all three covers here. I preferred the other one myself, but it helped me to be happier with that one.